Portions of the text of this magazine are available online (click one of the links at right). His Name Shall be Called ... The need for a Redeemer and God's answer to the need. The Fullness of Time The factors of history that made the time ripe for the coming of the Deliverer. Unto You a Savior The Bethlehem story and the angels' appearance to the shepherds. We Have Seen His Star The story of the Eastern wise men who followed the Bethlehem star. He Hath Annointed Me ... Jesus' ministry begins and the events at the wedding at Cana. At Jacob's Well Jesus has a life-giving conversation with a woman at a water well in Samaria. The Healer Jesus' power to heal restored a leper, returned personal mobility to a paralytic, and flowed through a touch to a woman with a long-term illness. The Invitation Jesus invites people to find rest and spiritual peace in walking with God. Blessing the Children Jesus loved children and prounced His blessing upon them. The Last Night Christ institutes the religious service that will be the memorial of His sacrifice. He Loved Us ... See Jesus in agony of soul in the Garden of Gethsemane, just before His suffering and death. In Pilate's Judgment Hall Jesus is arraigned before Roman authorities, acquitted and then surrendered to a mob. Calvary Jesus' words from the cross, His death, and the signs in the earth and sky. I Am the Resurrection ... The victorious Christ takes life again and promises life to His followers. He Is Risen The news of Christ's resurrection becomes known. To My Father ... Jesus ascends in the sight of His disciples and a promise that He will return. 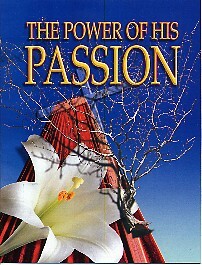 Note: The "Power of His Passion" magazine in printed form is 32 pages, approx. 8" x 10.7". The text of this magazine, written by Ellen G. White, was taken from The Desire of Ages.